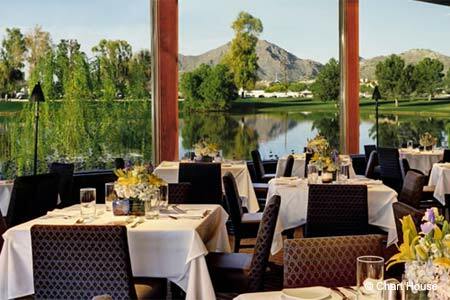 With views of the manmade lake, this corporate restaurant offers fresh seafood in a romantic setting. : Overlooking a man-made but attractive lake, this elegant, nautically-themed restaurant automatically puts you in the mood for seafood. Selections feature shrimp, lobster, king crab legs and lots of other recognizable fish that's flown in daily (including the signature macadamia-crusted mahi mahi), as well as prime rib and steaks. In keeping with modern times, there's a gluten-free menu, too, featuring dishes like lobster with Yukon Gold mashed potatoes. Many diners come just for the well-stocked salad bar, which includes shrimp and caviar. Portions are huge, so come hungry, but save room for the hot chocolate lava cake.